More and more of the snowbirds who have been frequenting the coasts of Florida and Texas are spending their winters farther west. They have discovered the beauty of the desert. Low humidity, sunny skies, and long picturesque views have won them over. Of course, winter is the best time to visit the deserts. Temperatures range from cool to comfortably warm. Most crawly creatures are sleeping away their ‘winter’ and the weather is great for visitors to get out and walk among the strange desert vegetation. 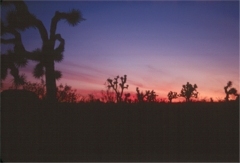 One of the very scenic drives is found in eastern California passing from Death Valley NP south through the Mojave Preserve to Joshua Tree NP. 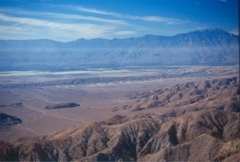 It’s a drive filled with a variety of desert scenery. The bajada is a feature not observed where there is a lot of vegetation. It is a broad apron of debris accumulated around the cliffs and the resulting view is that of a sea of small mountains surrounded by sloping oceans of sand. This route roams across desolate flat lands and up and down numerous small mountains. There are always mountains in view and as you approach the tops of the ridges you never know when you will be entranced by a wonderful jumble of blue mountains and hidden valleys where you can see wave upon wave of purple ridges rolling to the horizon. Normally, we would take this trip south from Furnace Creek, in Death Valley NP but the summer of 2004 arrived with deadly floods that have closed many of the roads in the south of the park. Instead I suggest going west from Las Vegas to Shoshone and heading south from there. Many highways do not have installed culverts. Instead there is a dip in the road where the water crosses. Most have warning signs that tell you not to enter when water is flowing. You might wonder if water ever flows there but a careful look at the erosion at the end of the dip, or at the sand and stones strewn across the pavement might change your mind. Cars do get carried right off the highway from the force of the water in these flooded dips. The Amargosa River drains a vast area to the east and eventually the highway crosses the several branches of the river. It’s strange to see so many culverts in a row under the highway with not a drop of water in sight. 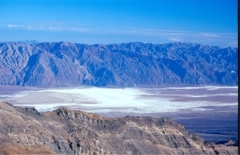 After the river rounds the southern end of a mountain range it then swings north to drain into Death Valley where it forms a lake for a while, and eventually evaporates leaving the white salt pans that are first to catch the eye of the visitor to the park. 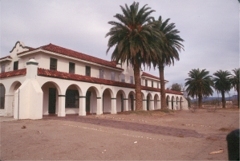 In the Mojave Preserve, a long descent through cacti and creosote bushes takes you to Kelso Station, an old railway station of beautiful Spanish architecture that may become the new park headquarters for the vast Mojave Preserve. The nearby Kelso Sand Dunes rise to over 600 feet above the desert floor in a profusion of shapely curves that extend far down the valley. Although difficult to climb it might be worth the effort just to slide down one of the steeper faces, or to listen to the music of the sliding sand. Eventually, you make another winding climb before rolling down another long slope to Amboy where the flow from an ancient volcanic cinder cone left a streak of black lava across the dry sands toward dry Bristol Lake. On the lake, sand dikes surround evaporation ponds used to collect salt. For miles the vegetation changes from lowland desert plants to highland varieties and back again as the roller coaster ride continues, taking you to the top of the Granite Mountains where erosion is creating strangely sculptured pillars and scattered piles of massive boulders. In the town of Twentynine Palms artists have painted beautiful murals with western themes onto the sides of buildings. In nearby Yucca Valley, Hollywood has captured the beauty of the surrounding area on film in ‘It’s a Mad Mad Mad Mad World’. For more desert scenery head south into Joshua Tree NP which has a fantastic variety of eroded mountains, huge boulders, and a couple of cactus patches. 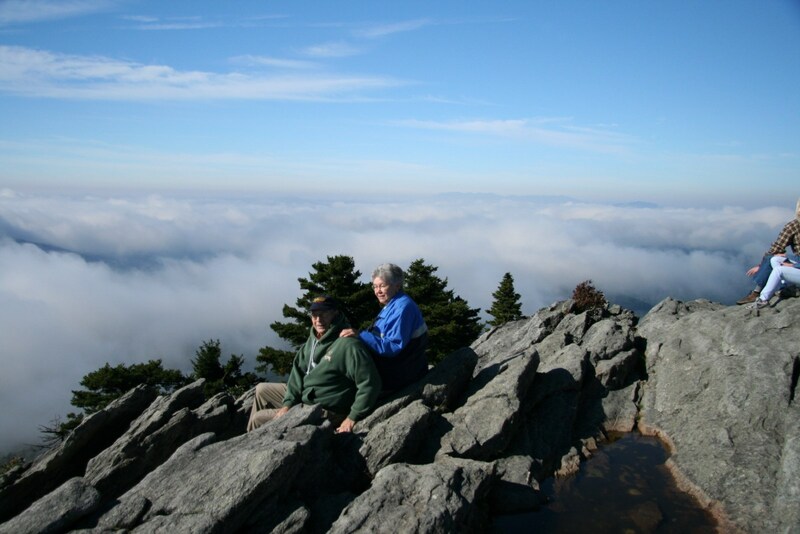 Many tourists who drive the Blue Ridge Parkway take time to visit the famed Grandfather Mountain in North Carolina. 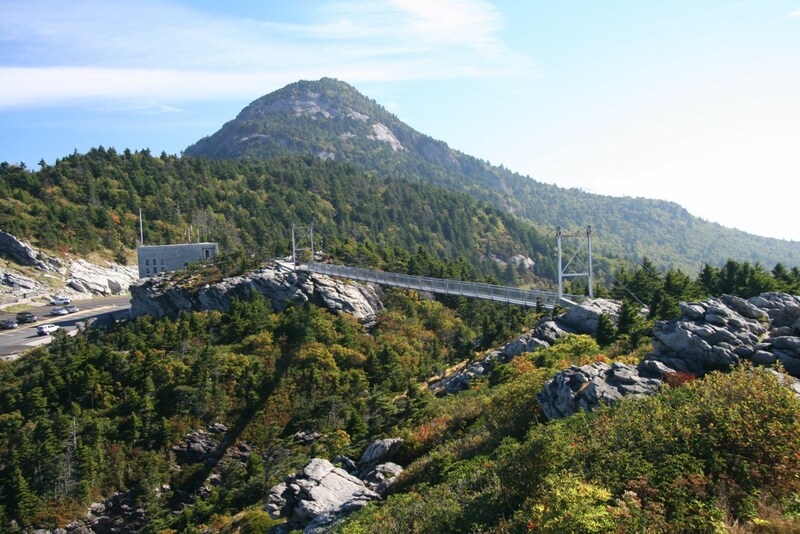 There they walk across the Mile High Swinging Bridge, scramble over the rocks to a comfortable viewing point to view the countryside below. 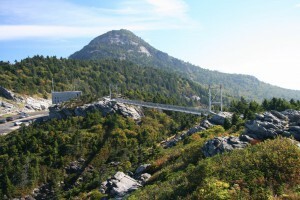 The 69 metre suspension bridge jumps a 24 metre chasm between two outcropping of the rugged mountain structure at an elevation of 1617 metres. Don’t be misled by the movements of the swinging suspension bridge as you walk across. It is a well built structure and firmly anchored, as it needs to be. The winds can really whistle through these peaks sometimes. 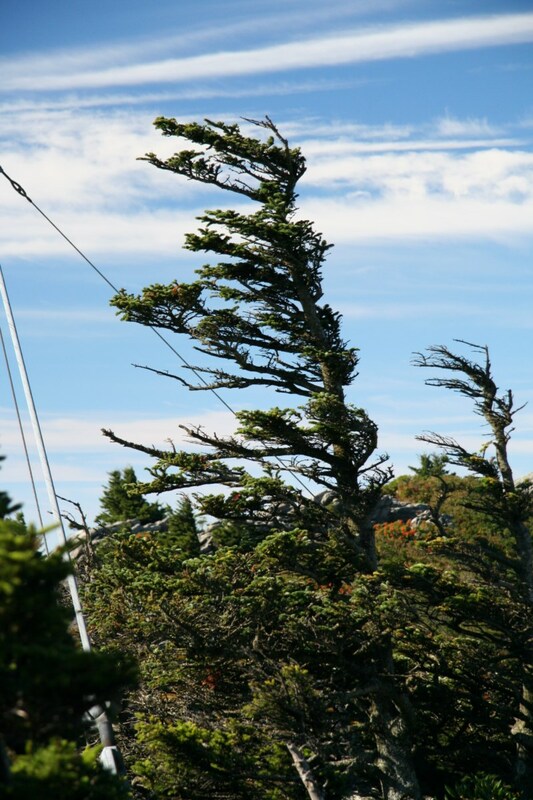 Note the trees up here with their limbs all pointing in one direction. 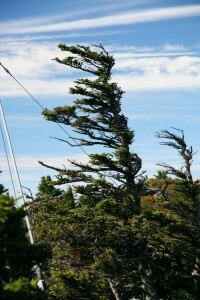 It’s easy to see where the wind blows from most of the time. There are several hiking trails for your enjoyment. 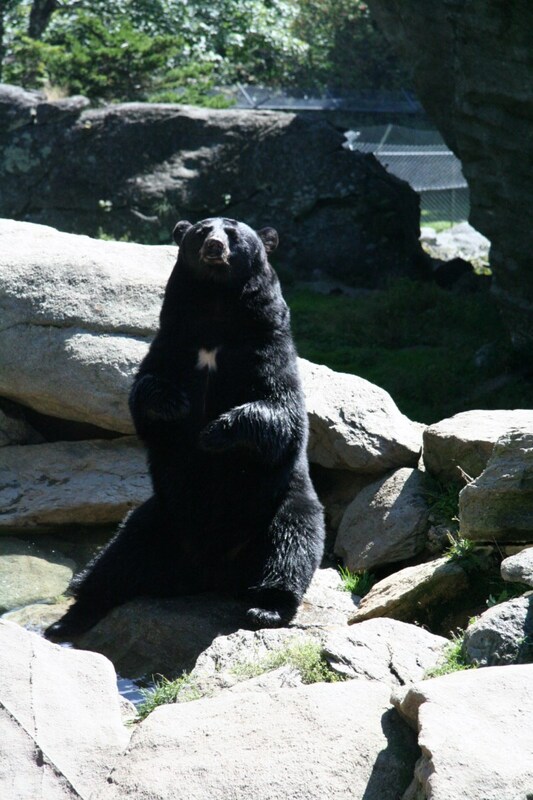 Since the mountain is home to many endangered species it is one place you can go to see rare plants. When we were there the mountain ash trees were loaded with red berries and along with the dazzling displays of flowers it was a great visual feast. Adding to the enjoyment were the frequent far views visible from the open mountain side. There are several habitats for a variety of animals where you can get close to the animals. Nearby there is an inside museum with area exhibits. 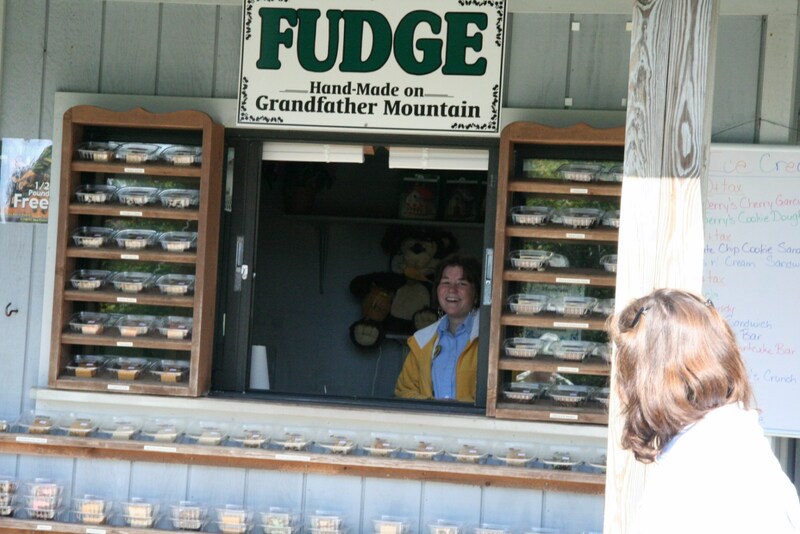 There is also a homemade candy shop that you will enjoy visiting to replace some of the energy you’ll use up roaming among the sites.